THE HAGUE, WILLEMSTAD - Last week Gerrit Schotte arrested in Curacao and interrogated for days. The former Prime Minister appears to have received lots of money from Francesco Corallo, a casino magnate who is closely associated with the Italian Mafia. Schotte was in October 2010, the first prime minister of the new country of Curaçao. Thereafter, he looted the treasury in two years. Schotte tried to give Corallo a diplomatic function at the Central Bank. Under Schotte, the underworld stole massively from the secret service Curaçao - including information from the AIVD (Dutch secret service). This week, it appeared from the report of the ‘Committee Stiekem’ how important this is for the Netherlands. 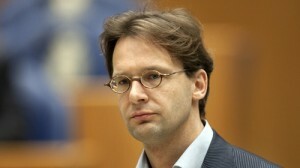 The matter was discussed in secret with the chairmen of the Lower House in the Dutch Parliament. Being Prime Ministers was for Gerrit Schotte the culmination of a criminal career. He could count on influential friends like Robbie dos Santos, the lottery boss in Curacao and also Francesco Corallo, the casino boss in St. Maarten. Premier Schotte was an errand boy of the underworld. In the U.S., he tried to get frozen funds of Dos Santos. He asked help from Italy to get a diplomatic passport for Corallo. But Schotte received this position thanks to the Netherlands, which in 2010 did not prevent dubious figures of taking over government positions. The Government of Schotte ended in September 2012, when Helmin Wiels decided to terminate his support. Wiels had supported Schotte in October 2010, to keep the old elite out from the government at the start of the new country. But he soon realized that he had helped the underworld in the saddle with Schotte. On May 5 last year Wiels was killed horribly, after he had announced that he will make criminal practices in the government of Curacao public. The investigation of the intellectual authors of this murder is slowly coming to an end. In Schotte’s case, people were interrogated and house searches done in Curaçao, Sint Maarten and Italy. Meanwhile, after prolonged pressure from the Dutch parliament, there was a large-scale investigation initiated into the links between politicians and the mafia in St. Maarten. The investigation on the relationship between politics and the underworld has also led to aggression and intimidation against journalists in Curacao. Whatever the outcome of all these investigations will be I do not know. Also, we do not know who gave the order for the murder of Wiels and precisely how the criminal networks between Sint Maarten and Curaçao works. But what I do know is that we cannot close our eyes anymore. The politicians in the Netherlands must recognize that these islands are in the grip of mafia figures. The supporters of the new political relations in the Dutch Lower House (PvdA, CDA, D66, Christian Union and GroenLinks) must finally realize once again that mainly the mafia has benefited from the greater autonomy of Curaçao and Sint Maarten. Curaçao and Sint Maarten are beautiful islands with wonderful people. But they are also islands with great contradictions. Where wealthy foreigners come to evade taxes, while many islanders who can barely maintain their own families. And they are islands where mafia figures are rich because of fraud and money laundering, drug trafficking and trafficking in women. Next week in The Hague, Dutch MPs will meet with MPs from Aruba, Curaçao and Sint Maarten. I want to instruct the Dutch Government to offer their support and assistance in the fight against the Mafia. But that is only possible if the politicians on the islands are also cooperative. In return for our support, I will ask them next week to give an insight in the financing of their parties. Fraudulent money will have to disappear from politics on the islands.